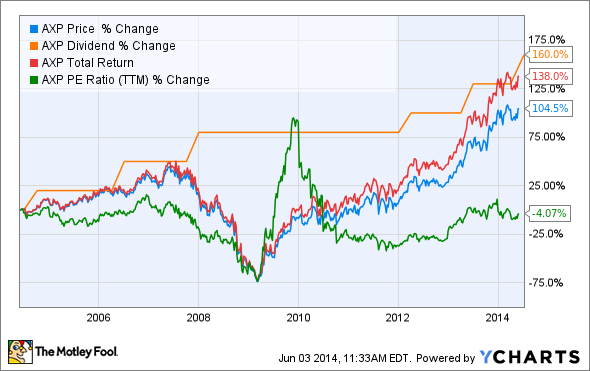 Why does American Express deserve its spot on the Dow? The Dow Jones Industrial Average (DJINDICES:^DJI) has been America's most-watched market index for decades, despite -- or perhaps because of -- its narrow focus on a mere 30 stocks. Where other indices might track 500, or 2,000, or even 5,000 different stocks, the Dow's steady focus on 30 business bellwethers has made it both easier to understand and easier to dismiss as a relic of simpler times. But as long as this index remains front and center in every day-to-day market analysis, it and its component companies will remain the most important barometers of American markets. That's why it's important to understand not only the Dow, but its members as well. What do they do? What do they represent on the Dow, and why do they matter to the American economy? Where have they come from and where might they be heading? Today we'll dig into the details of American Express (NYSE:AXP) to find answers to these questions and more, so that we can understand not just what moves the Dow, but why. Joined the Dow: Aug. 30, 1982. American Express has been a leader in financial-services innovation since its founding over 150 years ago. The company was originally built on delivering important documents -- hence the Express part of its name -- in the 19th century, and eventually controlled as a substantial part of the American railroad network by the early 20th century. AmEx also established itself as the go-to source for travelers' checks toward the end of the 1800s; this proved to be the business decision that would shape the company to this day, as AmEx leapt into credit card issuance a mere month after the first BankAmericard -- the predecessor of fellow Dow component Visa (NYSE:V) -- launched in 1958. American Express might today be a distant third in terms of credit cards issued, as its 104.3 million card members worldwide pale in comparison to market leader Visa's 800 million, but it makes up for this discrepancy by boasting a dominant lead in usage per card. In 2012, only 9% of the credit cards in the United States were AmEx, but each AmEx card racked up an average of $945 in monthly charges, more than triple the average monthly Visa bill of $295. AmEx card members' enduring loyalty gives the company a near three-to-one lead in annual revenue over Visa. However, the two companies' differing business models -- AmEx absorbs much more direct risk than Visa because Visa cards tend to be issued by third parties -- mean that AmEx's bottom line is almost identical to Visa's, despite its larger top line. 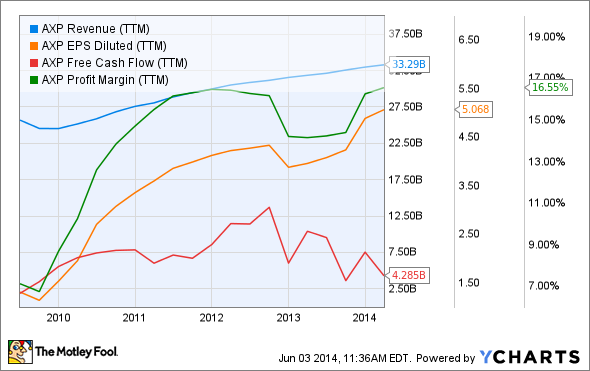 AXP Revenue (TTM) data by YCharts. American Express has done far better at improving its bottom lines, both on the income statement and the cash flow statement, than it has at boosting revenue. That's a rare feat for such a large and well-established company, but AmEx's loyal customer base keeps racking up the charges even as the company itself works to better control its costs. In its latest quarter, AmEx card members increased their spending 6% year over year, while its write-off rate (the amount of card debt it can't recover from delinquent card members) has remained below 2% globally for over a year now. AmEx remains a Wall Street darling despite its size, as analysts expect the company to improve earnings per share by nearly 12% this year, and by an average of over 10% per year for the next half-decade. At that rate, AmEx will wind up with annual EPS of at least $8.25 by the end of 2018, which makes its current share price a relative bargain.